Searching For The Sun In Candle Light…. As highlighted in the Forward written by Prof. R. V. Kolhatkar, Ex Director of Institute of Architecture and Design, Hyderabad, if one goes to any bookstall on airport, railway station or even remotely located town bus stand, there will be number attractively printed and colored books praising Vaastushastra displayed prominently in the showcase. And of course, there are customers who are ready to pay the fancy prices to buy them. But you may not find a single book challenging and exposing the myths built around Vaastushastra. Perhaps this so called Shastra is built upon endless untruths and it may be very difficult to expose all the untruths. However Searching For The Sun In Candle Light… written by Arvind Pakhle is one book which attempts to expose the frauds and falsehoods of the Vaastushastra. In fact this book is a 'collage' of extracts from many articles, books, conversations and discourses. Since the author is a practicing builder and developer of real estate in and around Pune, he has collected wisdom of truths about Vaastushastra during his professional career and has brought out them in the book form to help the frightening and gullible common people. It is quite surprising that no one had heard this ancient wisdom on architecture till 1980's and it suddenly appeared on the stage and caught fancy of middle class and rich class as though it is one time remedy for all the problems associated with fast moving life in recent years. One cannot forget that the progress of the society was not at all hampered in those 2000 years earlier to recent fad of Vaastushastra. In fact one can boldly say that it appears that when Vaastushastra was not practiced then only the society made lot of progress and brought happiness and worldly comforts to the individual and society. 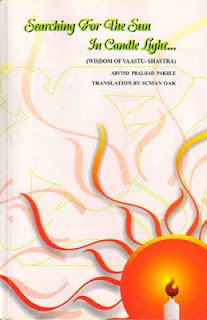 The author has tried to trace the historical background of Vaastushastra. According to him the cities of Harappa and Mohenjodaro evolved around 2300 BC were well planned. However, all this huge evidence of progress made in housing and town planning by the old culture was devoid of any mention of Vaastushastra. The Aryan tribes, arriving from the cold grass lands of central Asia entering into Sindhu valley in the northwest India, enslaved the native people and stabilized their own colonies. They needed to establish their superiority over the civilized natives. In this endeavor they invented abstract and mystifying concepts like heaven, hell, Moksha, Mantrashakti, and of course Chaturvarnya – caste system. They believed in Yadnya Vedi which appears to be the root of Vaastushastra. Their philosophy was founded on symbolism. Their Vedic culture gave birth to concepts like Shilpshastra, Manasar and Mayamat. Amongst them Shilpshastra narrates the basic principles of Vedic philosophy and might had more influence than other two concepts. The rules mentioned in Shilpshastra might have been propagated orally till recently. The author had listed a few details from Shilpshastra as samples. After going through these details one can conclude that the whole pseudoscience is constructed with the aim of strengthening the system of male dominance and the dominance of the society by the Chaturvarnya giving control to the Brahmins and subjugating the Shudras. The method of developing this so called 'Shastra' is quite strange which includes imaginary stories, imaginary characters like Vaastupurush, the concepts like Vaastumandal and Brahmasthan etc. In fact the author had devoted a full chapter on this Brahmasthan and proves beyond doubt how it is impractical and illogical. Everything appears to be fantasy in this so called ancient art of building constructions. In the chapter on Prudence in Vaastushastra, the author tries to see the whole scene through the eyes of Vaastu experts and feels that this cannot be science at all. While commenting on present situation, the author feels that the contemporary Vaastushastra as practiced by the experts selectively uses the dictates of ancient wisdom which are advantageous to them. It has taken features regarding the eight directions, plays with the meanings of Sanskritised names of these directions and how the portion of the house in particular direction is to be utilized. No one can give logical explanations for why people staying in a building, water storage, toilet, veranda etc located in East will face the problems like sterility, death, eye disease, heart problem, paralysis etc; why stair case built in northeast should result in abortion, mental illness or sudden death. According to Vaastu authority northeast is God's direction; as such water tank should be in northeast, slope of the ground and street should be in the northeast. No one can give any logical explanation for these absurd and totally irrelevant recommendations for house constructions to be built in 21st century or houses built in the last century. In fact the author convincingly explains citing examples of two representative layouts of the flats built as per Vaastushastra norms and concludes that it is impossible to build such a house/flat adhering to Vaastushastra criteria. He questions that does it mean that all those who live in the apartments not built as per Vaastushastra are leading a wretched life? Surprisingly these connoisseurs have instant answer for such objections too. As per their argument, every apartment has some features that are approved by this science and as such they are happy. If there is no happiness, then these so called specialists will come forward and bring happiness by restructuring (demolishing!) the whole house (and charging hefty fees!). Whatever may happen they never hesitate to blow their trumpet. The author even takes issues like shapes of the plots, the slope of the ground, examining the soil, the compound wall, the compound gate, parking arrangements etc in threadbare details in which Vaastushastra experts usually have something to comment and concludes how bizarre it seems to follow the instructions of this so called science. In fact the author wonders why the science of erecting the buildings had been linked to philosophy, religion and cosmic energy and why this science interlinks with 9 planets (Navagrahas! ), 12 zodiac signs and 27 Nakshatras. However not a single book explains in what way the shape of the plot is related to its being auspicious or inauspicious. It is generally explained in terms of positive and negative energy. The whole trend of thought is simply incomprehensible. In fact shapes of the plots, directions of the roads, slopes of the grounds and even naming the eight directions are all handy work of the people. There is no point in attaching any importance to these aspects as long as they are convenient and masking them as lucky or unlucky. When science of construction was in infant stage there were some empirical tests prescribed to examine the soil on which the house is to be built or slope, shape etc so as to minimize the construction cost as far as possible. But nowadays the construction technology had advanced so much so that it can overcome any issues relating foundation and one can construct building any where or on any soil condition irrespective of its colour or taste which were prime considerations in Vaastushastra. The criteria of Vaastushastra are not at all worth today. The Vaastu experts even have some opinion about the parking space. The idea of parking space might not have been there at all while Vaastushastra was developed in ancient period. But the experts say that parking should be either in east or northwest or the north of the plot. All these conditions apparently are quite foolish. The parking space is generally determined by the availability of the space and number of vehicles and their reach on the road and not by directions, heights and slopes. In spite of all these absurdities the people still fall prey to Vaastu experts. Probably the experts' aggressive marketing may be influencing their decisions or customers' predicaments. The talk of death of one's child, loss of wealth, incurable disease, being lost in debts, theft, accidents, calamity etc are such terrifying things, usually uttered by Vaastu experts, make listeners to take corrective action to their dwellings and spend the money. If Vaastu experts feel that customers is hesitant to spend the money as per their demand, the new breed of Vaastu experts have solutions even for this too. There will be some compromised solution and thus expert will extract money up to the last rupee. Nowadays they combine Vaastushastra of Indian origin with Feng Shui of China and suggest some methodologies to balance the 'energy'. For compensating the energy, they may suggest to place the tortoise (black!) a symbol of safety, long life and intellect, some photo frames, chimes etc thus swindling the customers. Earlier it was thought that Vaastushastra and Feng Shui are competing with each other to claim success. But nowadays there is a holistic approach, thanks to globalization of superstitions! The author had written open letter to the Vaastu experts and narrates his bitter experience of restructuring his own house as per Vaastu dictates to remove Vaastu Doshas. He lists these Doshas and what actions he took to reduce their ill effects. He even performed Navachandi Yagnya, started wearing Pushkaraj stone and a coral and made rings out of them to wear on fingers. But finally nothing good came out of all these. He concludes that these Vaastu professionals exploit the vulnerability and helplessness, the problems and misfortunes, the greed and temptations of gullible people constantly threatening them with dire consequences of not following their recommendations. There are number of cartoons and quotations interspersed between the pages and are quite interesting. On the back cover of the book the author had given the full text of the declaration of scientists on the illusory Vaastushastra which was signed by Dr. Jayant Narlikar. This is also a worth reading material.